Once we had been scheduled for treatment at the Mayo Clinic, we needed a place to stay. At the suggestion of a local resource, we contacted the Rochester, MN Chamber of Commerce. 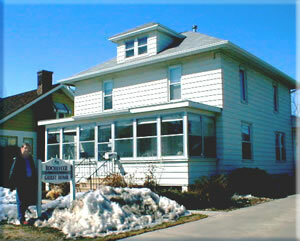 Two phone calls later, we found lodging at the Rochester Mennonite Guest House, located close to Saint Marys Hospital. Volunteers run the Guest House. Its mission is to minister to those who are being treated at the Mayo Clinic. As an affiliate of the Mennonite Church, the Guest House contains no radios or televisions. However, other creature comforts such as telephones, microwaves, and a washer and dryer are available. Not being bombarded by mass media was peaceful. The staff helped us through the rough times. When Tom had his eye removed, they sat with me in the waiting room. Each night they'd make sure I returned safely from the hospital. They visited Tom in intensive care. They took telephone messages for us. Several have become good friends. The guests became a support group. We all had suffering of some sort in common. That tie enabled us to share our cares and concerns without feeling self-conscious. We laughed and cried together. This healthy camaraderie uplifted our spirits and helped us cope. We have stayed at the Guest House on subsequent visits. Each time, we have met individuals who have touched and enriched our lives.